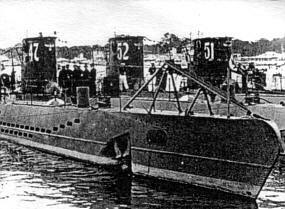 U-47 was a second-generation class VII submarine - a type VIIB - and was manufactured at the Krupp Germaniawerft in the North Sea port of Kiel between 1936 and 1937 as part of a batch of five boats numbered from U-45 through to U-50. The Kiel works had also built nine other Type VIIB boats - U-51 through to U-55 and U-99 to U-102 - and among the fourteen Type VIIBs the factory produced were perhaps the three most famous U-boats of the early part of the war: U-47, U-99 and U-100, skippered by Günther Prien, Otto Kretschmer and Joachim Schepke respectively. 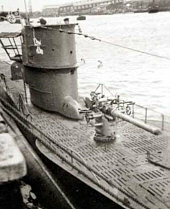 The list of Krupp Germaniawerft's successes also included U-48, which saw four skippers and was to become the most successful U-boat of the war before being reassigned as a training vessel in 1942. Two other factories also manufactured Type VIIBs - the Bremer Vulkan in Bremen-Vegesack (U-73 to U-76) and the Flender Shipyards in Lbeck (U-83 to U-87). Left: U-47 is launched for its first test run at the Krupp Germaniawerft at Kiel, 29 October 1938. 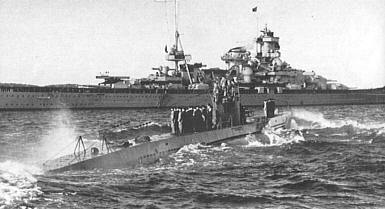 Right: U-47 sitting in dock with its sister vessels U-51 and U-52. Kiel, 1939. 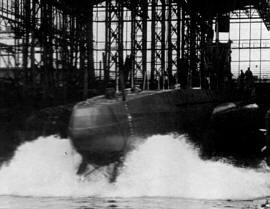 The vessel that was be designated U-47 was finally completed on 25 February 1937, and was given its test run on 29 October the following year. It was assigned to the then Oberleutnant zur See Günther Prien on 17 December 1938, and went on to see ten combat Patrols before being sunk in March 1941. Two views of U-47. Left: A view of the deck, with a good profile of the 88mm gun. Right: The crew of U-47 taking the salute from the crew of the Gneisenau-class battleship "Scharnhorst" on its return from Scapa Flow in October 1939.